A romantic retreat Cornish style. 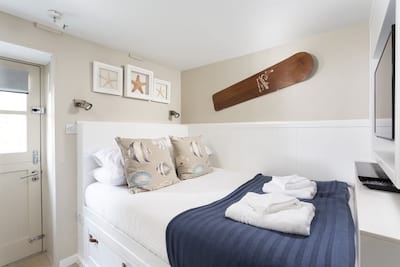 This recently converted hideaway-for-two is the perfect base from which to explore the nearby coastline of North Cornwall and enjoy some well earned restful time out. A fusion of the original Calf house charm and more modern order makes this adorable holiday home a perfect base whatever the season. With a nod to the original calf house this impressive barn conversion oozes rustic charm features from the salvaged beaten wood shutters and vintage milk bottles to the agricultural trusses and exposed granite plinths. Amidst the country chic nuances the striking modern influence brings this stylish bolthole bang up to date. The living, dining and kitchen space is open plan with high ceiling and exposed beams, a lovely inviting space full of natural light. A contemporary kitchen with smart raspberry red splashback and all the mod cons to help you get creative with some of Cornwall's finest homegrown produce. A white cafe table with pretty pink dining chairs. At the gable end of this large space is a cosy three seater sofa and large flatscreen TV for that cinema experience. A few steps up leads to the generous king bedded room with rustic shutters and original high ceiling beams, this indulgent boutique bedroom offers the perfect haven to ensure a restful nights sleep, awake to the morning sunshine. No less generous the chic bathroom continues the luxury twist. From your holiday door the large cottage style courtyard is to the front of The Calf's House. A bench made for two is well placed to capture the morning sun and a raised patio area with outside table makes al fresco dining a tempting option from lazy breakfasts to sunset sundowners. The wonderful beaches of Watergate Bay, Mawgan Porth and right up the coast to Harlyn Bay and Treyarnon Bay are all within a short drive, the bustle of Padstow harbour is lovely for an evening stroll with fish and chips in hand or enjoy a slap up meal at one of Rick Stein or Paul Ainsworths eateries. Day trips to St Ives, Falmouth or Fowey are again an easy option, enjoy the contrast of coastline from north to south. Utilities include a washer/dryer and iron/ironing board. A clothes airer is available on request. Wonderful property would recommend to anyone who wants a relaxing base that is dog friendly but that is still luxurious - bathroom is gorgeous! We have just returned from a super week staying at The Calf House near Mawgan Porth. The property itself is just lovely, very secure garden, spotlessly clean on arrival, very nicely furnished and equipped - it genuinely ticked every box for us. 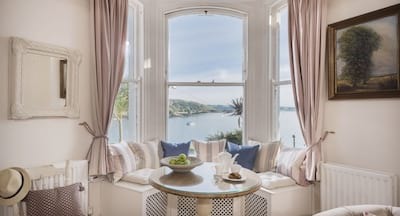 This is the first time we have booked through Cornish Gems and it is fair to say that our expectations (which were already high!) were significantly exceeded!!! Overall a brilliant week and so glad we chose this beautiful property as our base for a dog friendly week in North Cornwall - we will be back! The Calf was lovely and secluded. A wonderfully converted barn, very spacious for 2 people and a fabulous bathroom. Good location for North Cornwall. Really impressed with the Cornish Gems information and customer service. The texts sent were great and liked the personal touch of the phone call to check everything was OK the morning after arrival. We enjoyed our stay very much in the beautiful cottage The Calf House. It is beautiful furnished and the garden is very private. This is a beautiful cottage in a very peaceful location. It was perfect for a romantic week away together. Overall the property was very good and enclosed garden suited us perfectly for visiting with dogs and the little extras were a lovely touch. We would certainly consider The Calf House again for a short break. A beautiful property within beautiful grounds. We really enjoyed staying at The Calf House and we are considering booking it again for our holiday next year. Very good for our small dog, very secure and safe, excellent location for most of the popular areas of Cornwall. We had a lovely holiday. The Calf House is beautifully presented and is in a quiet location (fantastic to get away from crowds). We have already recommended this property and given details to friends who saw pictures of our stay on facebook. Thank you. Very impressed with the standard of the property and the little extras they provided. We had an absolute fabulous time at the The Calf House. The property was very nicely equipped and fitted out. It really was a gem of a place to stay. The location was also very handy to reach all parts of Cornwall. I would highly recommend this property. Many thanks! We enjoyed our stay in a beautiful property. We have stayed in the Calf House for 3 weeks!! Fantastic place to stay! Felt so at home! spacious, and luxurious! From here, we have explored Cornwall! We had a fantastic weekend. We have previously stayed in The Roost and will definitely be returning to the barns next time we visit Cornwall. Great location. Very quiet and private. Delicious welcome hamper plus milk and water in fridge. Appreciated courtesy calls from Cornish Gems. Beautifully presented property. Great service from Cornish gems. Definitely will be booking again! Thanks again for a great week. Want to go back again! We loved the house and would book again. The Calf House has been beautifully renovated, you can live in your very own 'grand design' for a week. Welcome pack and service was much appreciated and we loved the converted barn. Brilliant (and I mean that). Had a very good time, and the property was great. Thank you so much Cornish Gems for a wonderful holiday ... We could not fault The Calf House and will consider this property again when travelling to Cornwall. The Calf House is beautiful and has been decorated to the highest standards. The outside space was amazing and would recommend any of the barns to my friends.